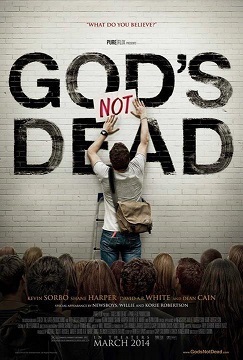 An Apologist’s Insights on “God’s Not Dead” | J.W. Wartick -"Always Have a Reason"
I recently had the chance to watch “God’s Not Dead,” a film which presents a story in which a college student decides to take a stand for his faith against the pressure of an atheistic philosophy professor. A summary of the plot may be found here. As an apologist with an MA in the field, I thought my comments might help provide some insight into the film. I’ll offer a look at some aspects of the film which I wanted to address. Feel free to chime in in the comments with your own thoughts. The movie presents a clear picture of the need for apologetics. When challenged by attacks on the faith it is important to always have a reason for the hope within (1 Peter 3:15). Josh Wheaton–the protagonist–put together a decent presentation of various evidences for theism in the snippets that viewers get through the film. Of course, these are very simplified and don’t address several major issues with the arguments, but it gets the point across. It also, I have noted through conversations with others, spurred much interest in the area of apologetics. That’s awesome! That said, I think there are some issues with even the arguments presented in the film. First, after Wheaton has presented the cosmological, design, and other arguments for theism, he is challenged by Professor Radisson on the notion that one just has to choose between atheism and theism. Wheaton acknowledges that yes, it is a choice. Now, there are a number of issues with this portrayal. First, it treats the balance of evidence as a kind of 50/50 proposition, which is, I would think, hardly the position of anyone. Second, it presents a view of belief in which we can just choose what we believe. This is called “doxastic voluntarism” which is a fancy way of saying that one can believe propositions at will. But that is a highly controversial position (just try to force yourself to believe that “Fairies fill my refrigerator every morning” and you’ll see the folly of it) and also flies in the face of biblical accounts of what faith is. Third, here I’ll tip my bias a bit and say I’m fairly well convinced that the balance of evidence is hardly 50/50 but actually compelling. Another difficulty with the apologetic in the film is that it seems like the lynchpin argument offered was actually just a point of rhetoric. Wheaton presses Professor Radisson and asks “Why do you hate God?” and follows it up with [paraphrased]: “How can you hate someone who doesn’t exist?” This is the last straw and what prompts the class to vote by standing to say that “God’s not dead.” Although I think rhetoric has a clear place in the Christian apologetic (and has since the earliest times: see the apologetic works of Lactantius and Arnobius in the 200-300s AD), I thought it was an odd choice to make it the climactic argument for God. Perhaps it was because this added to the drama of the moment–and I suspect that’s right–but it did so at the cost of detracting from whatever apologetic the film could put forward. I did, however, appreciate the interaction with some top scholars like Hawking and Lennox. I think it is very important for Christians interested in apologetics to read the top scholars in their fields in order to best get acquainted to the arguments. The way the Muslim father was portrayed was problematic. In the beginning of the film we see him dropping off his daughter and showing great concern for her. Later, he shares an intimate discussion of his faith and the importance of obedience in his background. But then, when it is revealed his daughter has converted to Christianity, he not only kicks her out of the house, but he also immediately hits her more than once. Now, I make no claims to being an expert on this, but I know from anecdotal evidence only that people are indeed kicked out of their homes for converting to Christianity (and sometimes for deconverting), and this is surely a bad thing. It’s not a bad thing to address this as an issue. But the problem I saw was that the Muslim father’s immediate reaction was violence, without any explanation or any background for thinking this would be a reaction. The rest of the film up to this point had shown him as a caring father who was concerned for the faith and well-being of his daughter. To have him immediately turn to violence when she converted was jarring and I think it speaks to our cultural presuppositions about the religious “Other” to portray the “Other”–the Muslim–in that way. We need to move beyond such stereotypes and into genuine dialogue with those of other faiths, always looking to share the light and love of Christ with them. On the positive side, the film did do a great job speaking to the importance of reaching out to others like the young man from China. It also emphasized missions in a number of ways, like centering some major plot points around a very amiable character as a missionary. I appreciated the comments about the work of a pastor, in which Pastor Dave in the film was comparing his own work to that of a missionary friend’s and felt his own day-to-day tasks were mundane and trivial. The answer given by the missionary, however, was essentially that such work is part of the work of God as well and that we each occupy a place which God has put us in to make an impact on the world. I thought this was a great message and one that deserves further exploration. For example, would it be “denying” Christ to acknowledge that one might not have the resources available as a freshman student in a general studies philosophy class (and not a major) to take on a philosophy professor on the topic of God’s existence? I don’t think so. One could instead acknowledge that both the clearly adversarial tone taken in the environment and one’s own lack of knowledge or expertise in the area make it likely that one may actually harm the body of Christ by, well, looking like a freshman non-philosophy student outmatched by an atheistic philosophy professor. Wheaton, of course, has the benefits of film, so he is able to put together a beautiful powerpoint each week and manages to pound the books so hard that he can articulate the cosmological, design, and other arguments within a few days. But is this a realistic perspective? Moreover, is it a “simple” application of the passage to our lives? “God’s Not Dead” awakens people to the need for apologetics. That is a great compliment, because it is a much-needed awakening. However, it has several issues (including those mentioned above) with the presentation of apologetics, its portrayal of the “Other,” and the oversimplification of several arguments, positions, and even pastoral care and reading of texts. In short, it’s a mixed bag. How very, very mild of you. Well quoted. I have been repeatedly treated in this way by atheists and skeptics, but I am under no delusion that this treatment is unique to atheists and skeptics. I have no doubt that I probably do this thing to others, given the human tendency to repeat behavior one has received to other people. We do not need Christian films to promote this terribleness. I would be so vulgar to say that it’s like taking a whiz on imago dei and agape. But atheists usually don’t approach others with an advertisement to love them unconditionally (I have always encountered a desire from atheists to respect common rights and freedoms… which is why I’m always disappointed when atheists are presented as if they don’t). Atheists tend to comment with criticism. And this criticism shows up in all kinds of ways and in all kinds of tones. But I agree with you that it’s all too common to stereotype the ‘opposition’ and this is a human failing. But there are shared themes in need of criticism and I think it is fair to address their uses and roles. Atheists might not, although here is an atheist who requires I show him “the one religion that has no harm”, as if he has a morality (his model of morality) which causes no harm. So one does see atheists portraying themselves as paradigms of excellence. And really, plenty of Christians admit their inability to unconditionally agape particularly well. How the comparison plays out if you look at the empirical evidence, I don’t know. Who has an unbiased, representative sampling of the relevant evidence? (1) There is a better way to live! And yet, their actions show that they haven’t a clue as to how to actually live this better way. They talk the talk, but they don’t walk the walk (Mt 23:1–4). Well, if nobody can actually do it, then what they’ve really, truly done is convinced folks that if anyone could do it, it’s they, and since even they cannot do it, it’s impossible. Or at least, that’s how I reason to the name of God being blasphemed among the Gentiles because of the Jews. And, of course, the translation now is: because of the Christians, as one is a Jew by faith, not by flesh (Rom 9–11). I did, however, appreciate the interaction with some top scholars like Hawking and Lennox. Lennox is a relevant top scholar, but Hawking is not: his specialty is in physics, not philosophy. Likewise, the movie listed Dawkins as an atheistic philosopher, but he isn’t. His philosophy is despicable, something on which atheists and theists agree. The movie is a terrible straw man of atheism, and actually a straw man of Christianity as well. Lone ranger Christians for the win, eh? All the pastor does to help you along is give you a guilt-trip verse? (If you deny Jesus before people he will deny you.) So much for the sign of Christianity being love for fellow Christians (Jn 13:34–35) and unity of the body of Christ (Jn 17:20–23). Aside from what I mention here and what you mentioned, you’ve blatantly ignored the revenge flick nature of the film. Christians sing praises to God while atheists die in horrible accidents, with magical deathbed conversions via compassion-free Christians? Faith is presented as mostly intellectual assent, over and above agape. For a less charitable (but funnier) reaction to the film, see my live-tweeting of it on my Twitter account, here: https://twitter.com/robertkwhitaker. (scroll down to Aug. 31). I guess it’s intellectually cool to bash the film. However, please remember that it is indeed a film and therefore screen time is very precious. The time doesn’t exist for great detail. The question, in my opinion, is simple; Does God’s not Dead provide the overwhelmed believer with a “cheer worthy” experience while also providing him with some concrete apologetics? The answer is a resounding yes. Now you may return to explaining to everyone how you would have done it better. 1. What do you think of the fact that the protagonist had not one single other Christian actively helping him prepare his defense? 2. What work did you do to ensure that you found the best rebuttals/critiques of said “concrete apologetics”? 3. Are you 100% convinced that there was no harmful stereotyping in the film, of the kind which damages the ability of a person to understand and thereby love others? Interesting to see your take on it. I had many mix feelings and felt there was much difficulty in actually forwarding the actual apologetic thrust in the film. I’m not sure I clearly remember the scene, but regarding the Muslim father’s “violence”, I have to say that for us here in the East a couple of slaps is not violence. And this is an “Other’s perspective”, you need to take into account. Have seen the film a few times now. I do not expect much from any film as 90 minutes or so is a small window in which to place a narrative with multiple characters and sub-plots. But Pure Flix have created something really worth watching here. As for the stereotyping, I thinks that some are too overly sensitive and unwittingly influenced by PC views and are reading this into the film. The girl and her Muslim father was pretty poignant for me as I know of a ministry which works with the Muslim population in Southampton UK. Being thrown out for becoming a Christian with a couple of slaps is a light punishment considering other stories I have heard. The apologetics material was patchy at best but it did help build the tension between Josh and Raddison and bring out the professor’s hatred of Christianity and the reason behind it. A bit more argumetation would have been great though. The sub plot concerning the reporter Amy was interesting and also heart breaking but ended up in that beautiful scene when The Newsboys prayed with her.One of my favourite scenes in the film. All in all I think it is a pretty decent film and I have even been able to show it to an atheist friend who asked me some questions after viewing it. Some great music in the film and I have been listening to Fair Haven’s ‘Chasing The Sun’ and Stellar Kart’s ‘Ones And Zeros’ over and over.